Do you want to test KDE applications from master without installing KDE neon Dev Unstable edition. Maybe you have Dev Unstable edition installed but want to develop on your stable branch. Maybe you like your larswm setup but wonder if Plasma is the desktop for you and are looking for an easy way to test it out. KDE neon Docker images are the solution to quickly give you access to use or develop another branch without reinstalling your system or spending hours compiling. The above screenshot shows a computer running its normal Plasma desktop with three KDE neon Docker containers. 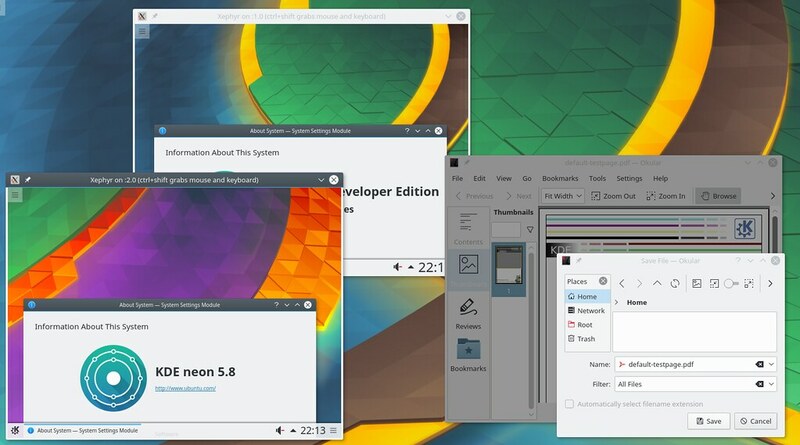 One is a full Plasma session of KDE neon User Edition, one is a full Plasma session of KDE neon Developer Unstable edition and one is a single app from Developer Stable edition running Okular. KDE neon Docker Images comes in two variants each with the same Plasma editions as our archives. Plasma images (~2GB) come with the same software as our installable ISOs, Plasma and minimal applications. All Applications images (~4GB) come with all applications built on KDE neon. Default user is neon and password is blank. The user has password-free sudo access. By default it will run a full session inside a Xephyr window. This will give you a Bash prompt, you can code as you would on your host machine and run X apps. Type exit to quit, the ~/src directory will be preserved on your host machine. You can also commit your Docker images if you make changes you would like to come back to such as installing applications. For more information on using Docker see Docker Engine user guide. This page was last modified on 16 March 2019, at 08:20. Content is available under Creative Commons License SA 4.0 unless otherwise noted.